It was a fun drive up Mt St Helens over the weekend. I was rooting for the sunset and there was some good light. But the highlight of the trip definitely was the milky way – suspended over St Helens. As we watched the stars drift across, the distant light on the horizon, lit up the clouds from beneath. It was ethereal. I have tried to capture that feeling and moment in time. Nothing in this shot was created in Photoshop, It was all there – the stars, the clouds, the distant light and Mt St Helens. This is a composite of 60 shots each with an exposure of 30 seconds. 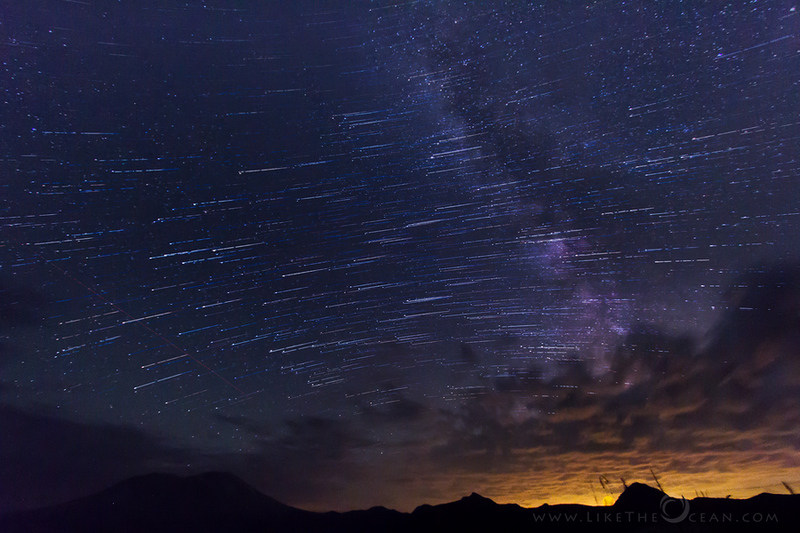 One of the intermediate shots was processed to highlight the milky way; others were processed to highlight the star trail. I present to you ‘Condensed in Time’ – Approximately 30 minutes from that night, condensed into a single shot for you to enjoy. Hope u like it !